Autorun is a feature in Windows that is meant as a convenience. A lot of times it is, but more often than not it become a hassle, as users do not always want to launch a CD or thumbdrive just because they put it in the computer. Aside from that, it is a fast way for viruses to spread. If a thumbdrive contains a virus, all it needs to launch itself is for autorun to initiate. Keep in mind that just because autorun is disabled you can still get to your CD or USB drive by going to My Computer and launching the CD ROM or USB drive. 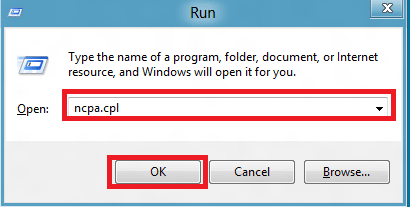 Launch the Run dialogue box by pressing Win + R, then type Gpedit.msc and press Enter. The Group Policy window should open. In the left pane, double-click Administrative Templates. In the right pane, double-click System. Scroll down and double-click Turn Off Autoplay. In the Turn Off Autoplay Properties window, select Enabled. Then from the dropdown next to Turn Off Autoplay on, select All drives and then click OK.
Exit Group Policy by selecting File, then choosing Exit from the menu. 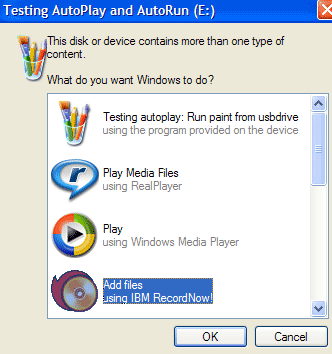 So disable the autorun option in Windows to help keep your computer safe from USB transmitted viruses. There may be times when you may have forgotten your Windows passwords and are unable to login to your PC, this can cause huge frustrations, if you do not have any other users on the PC, or do not have access to the administration account. The most dire consequences of forgetting your password could be reformatting and reinstalling your OS, however there is a way in which you can reset lost Windows passwords for your computer. In this article, I’ll walk you through the steps of using a password reset CD to reset forgotten Windows password with ease. You’ve done! Eject the password reset CD and restart your computer, you can then log in to Windows system without entering a password. With the password reset CD you can reset forgotten Windows password on Windows 8, 7, Vista, XP and Windows Server 2008, 2003 and 2000. It also supports 64-bit operating system. Right click on Desktop and select Personalize. Click on Display in the right pane. Then click on Adjust brightness in Display window. Then click on Choose what the power buttons do. Now in the System Settings window, click Change settings that are currently unavailable. Finally look for Turn on fast start up, it should be checked by default. Uncheck if you do not want Windows to have fast start up. That’s it. You’re done! To perform the above operation, you need to log on your computer as administrator. I have a home wireless network and forgot my wireless password. My computer will still connect to the network, but I want to set up additional computers. Using the computer that is already set up and connected, can I somehow figure out what the wireless password is? Some detailed instruction would be helpful. Forgot the password to your house wireless network? I have covered how to recover lost Wireless network key with WirelessKeyView in my previous post. Now I am going to show you how to recover Wireless password without using any software. 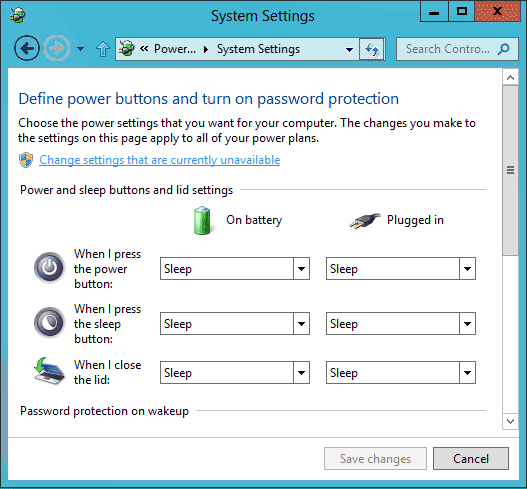 In Windows 7/8, it becomes much more easier to recover a lost Wireless password. 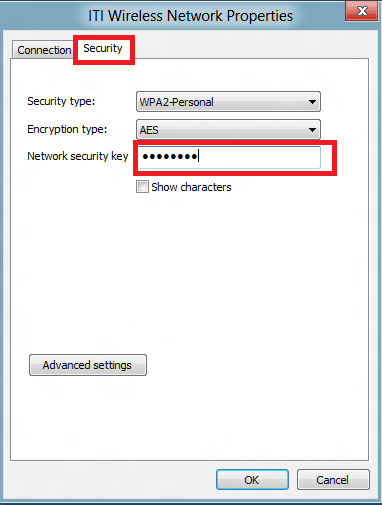 Let’s go through the steps below and see how can you recover Wireless password easily. To recover your wireless password we need to get to the settings for your network adapter, so press the Win + R keyboard combination and type ncpa.cpl in the run box, then hit the enter key. You will now see all the network adapters in your machine, right-click on the wireless one and select Status from the context menu. 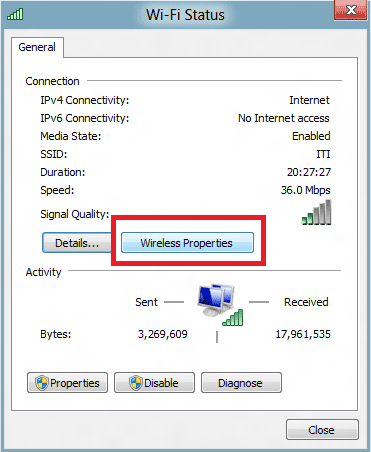 When the Wi-Fi Status dialog loads up, click on the Wireless Propertiesbutton. Then you will need to switch over to the Security tab. Finally, check the Show characterscheckbox to reveal your password. Note: This trick will only work if you are the local administrator on your machine, otherwise you will be prompted by UAC for administrative credentials. If you forgot the administrator password, you can use the Reset Windows Password utility to help you reset lost or forgotten Windows password with ease. Perhaps one of the most annoying things when it comes to using Windows software is forgetting your Windows account password. One may think that they need to format and re-install the operating system which can be time consuming and frustrating. Well for those people who believe this to be true, you are in luck. There is a method which will allow you to remove and delete Windows account password. 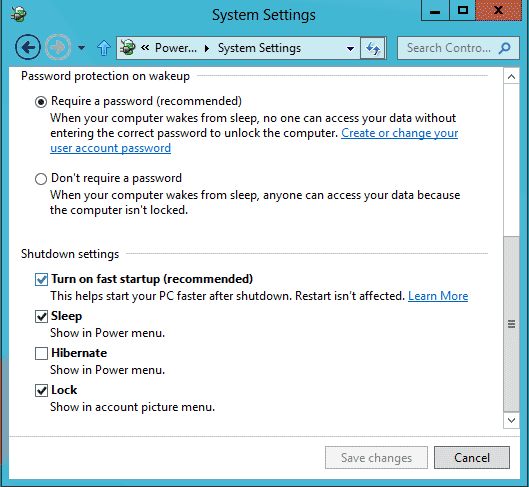 To access a locked computer can be an easy work if you have a Windows password reset disk. With Windows password reset disk you can quickly remove or delete any Windows account password on any system. If you don’t have such a disk, you can now create one and unlock your computer by following the steps below. How to remove or delete Windows account password? I’ll walk you through the steps of creating a Windows password reset disk and then use it to remove or delete your forgotten Windows password. First we need to find an accessible computer so we can create a Windows password reset disk on it. Download the ISO image of Reset Windows Password boot CD which is zipped. Extract the ISO file from the ZIP archive using WinZip. Burn the ISO file to a CD or USB drive using ISO2Disc. After a few minutes a Windows password reset disk will be created and we’ll used it later to remove Windows password. Turn on your locked computer and hold down F2 or whatever the setup key is shown as during the initial boot screen. This should bring up the BIOS. In the BIOS look for the Boot Device Priority option, set CD/DVD as the 1st boot device if you want to boot from Windows password unlocker CD. You can either set Removable Device as the 1st boot device if you want to boot off a Windows password reset USB drive. Next save your changes and reboot the computer. Once your computer boots from the Windows password reset disk, it will launch the Reset Windows Password utility. This utility automatically scans your hard drive and find Windows SAM databases for all your Windows installations. Choose a Windows SAM database. The program will display all Windows user accounts inside it. Select the Windows account whose password you forgot, then click Reset Password button to remove or delete your Windows account password. Next, remove the Windows password reset disk and restart the computer. You’ll then log in to your Windows account without entering a password. After getting into Windows, you can set a new password to prevent unauthorized access, but do remember to choose a safe one. Forgot Windows password and can’t log in to your computer? You can restore Windows to a recent restore point during which you were able to successfully log on to the system. The System Restore feature will make sure that you don’t lose any documents. However, programs that have been installed since the corresponding restore point have to be installed again. So is there a better way to fix this issue without reinstalling anything? The best and easiest way is to restore your forgotten Windows password. To begin, you need to create a Windows password reset CD on another accessible computer, then boot your locked computer from the CD so you can restore Windows password easily. 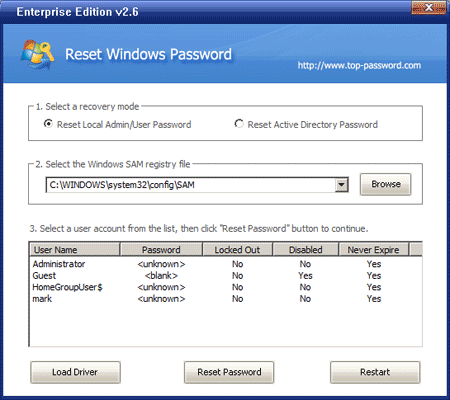 Download the Reset Windows Password utility from this link: http://www.top-password.com/reset-windows-password.html. Unzip the download file. After you unzip it, there is an ISO image file: ResetWindowsPwd.iso, which is what you need to burn. Burn the ISO image file to a blank CD or USB drive using the ISO2Disc utility. Here we’re going to use CD to create a password reset disk. Now we need to set your locked computer to boot from CD. Turn on the computer. Normally, the BIOS screen tells you the keyboard key you need to press to enter into BIOS Setup Utility. On most computers is Del, F2, F9 or F12 but yours might be different, so watch out for that on the boot-up menu. After entering into BIOS, set CD/DVD as the 1st boot device so you can boot off the CD; or set Removable Device as the 1st boot device if you want to boot from USB drive. Once your computer boots from the CD, it will load the Windows PE operating system on your CD. After one or two minutes, it will launch the Reset Windows Password program. Select the Windows SAM registry file for your desired Windows installation if there is more than one. The program will list all your Windows user accounts. Choose a user account and then click Reset Password button. It will restore your forgotten Windows password and you can then log in to your system with a blank password. After password restoring, you can regain access to all your data and files on your computer. No need to reinstall the operating system or any program installed on your computer. With this guide you can restore Windows password on Windows 8, 7, Vista, XP and Windows Server 2008, 2003 and 2000. When you perform a clean install of Windows 7 or Windows 8, Windows doesn’t show Computer icon on the desktop by default. Users need to manually add the icon to the desktop. In Windows 7 and previous Windows versions, adding the Computer icon to the desktop is a simple task. Open the Start menu, right-click on Computer, and click Show on desktop option to show Computer icon on the desktop. But how to place the Computer icon on desktop in Windows 8? As you know, Start menu doesn’t exist in Windows 8 and has been replaced with Metro-style Start screen. So, users can’t add Computer icon from the Start menu. Windows 8 users who would like to see Computer icon on the desktop can follow the given below steps. 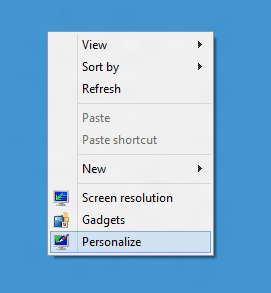 Step 1: Right-click on desktop and select Personalize to open Personalization window. 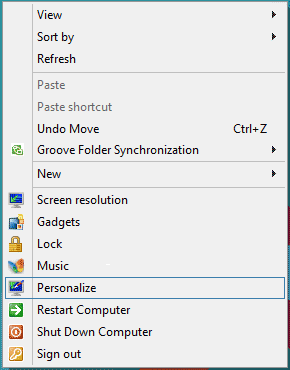 Step 2: In the left-pane of Personalization window, click on Change desktop icons. This will open Desktop Icon Settings. Step 3: Here, under Desktop icons section, tick Computer checkbox and then click Apply button to show the Computer icon on the desktop. You can also show/hide Recycle Bin, Network, and Control Panel icons on the desktop from here. You are done! The default icons Computer, Network, Recycle Bin and Control Panel can be replaced with a custom one by selecting the icon and then clicking on Change Icon button. Whether you plan to upgrade your Windows 7 machine to Windows 8 or buy a new PC with Windows 8 pre-installed, you can use Windows Easy Transfer to copy all your files and settings from your old machine or old version of Windows to your new machine running Windows 8. In this article, I’ll walk you through the steps of using Windows Easy Transfer and an external USB drive to easily complete the task. Click on Windows Easy Transfer from the list of programs. You’ll be presented with the Welcome to Windows Easy Transfer screen, which gives you an overview of what items you can transfer. Click Next to start. Now, select This is my old computer option to transfer files and setting from current PC. In this step, it shows currently logged-in User Profile and Shared Items options. You can customize the default folder and file section by hitting Customize. The Customize link present in User Profile section lets you pick Documents, Music, Pictures, Videos, Program Settings and Windows Settings, whereas the Shared Items section’s Customize link will open a Shared Items menu, allowing you to choose the shared items that are to be moved. Once you’ve selected the files, it will ask you to enter the password to secure the transfer process. Clicking Save will prompt you to specify the USB drive where your files and settings are to be copied. When the destination folder is selected, it will start copying the settings and selected folders. The time it takes to complete the copying process depends upon the volume of selected data. 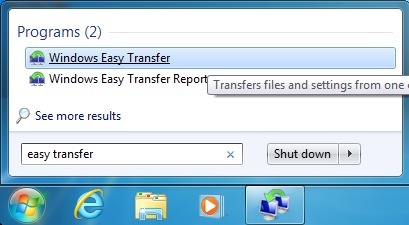 Window 7 Easy Transfer wizard saves all the settings, user folders, and files from Windows 7 in a MIG file. Now, eject the USB drive, and move to PC running Windows 8. To get started, open Windows Search from Windows 8 Start hover menu, enter easy transfer in search bar, and then click Apps. Now, launch Windows Easy Transfer utility from main window. In Windows Easy Transfer wizard, select An external hard disk or USB flash drive option to restore data and settings saved in MIG file. In next step, choose This is my new computer option. It will now ask you to plug-in the USB drive where the MIG file is saved. Plug-in the USB drive and select Yes to specify the Windows Easy Transfer file. On selecting the MIG file, it will ask you to specify the password. Enter the password to restore the data, and click Next. Once access is granted, it will ask you to choose what to transfer from old PC. At this point, you can select the files and settings that are to be transferred to your new PC. Click Customize under User Profile and Shared Items sections to select the folders. Once you’ve selected the settings and folders, hit Transfer to begin the settings and data migration process. After this has finished you will get a message telling you the transfer is complete. You can also see a list of what files and programs were transferred, or choose close to exit the wizard. Now you have the best of both worlds – all your important old files saved onto your new computer. 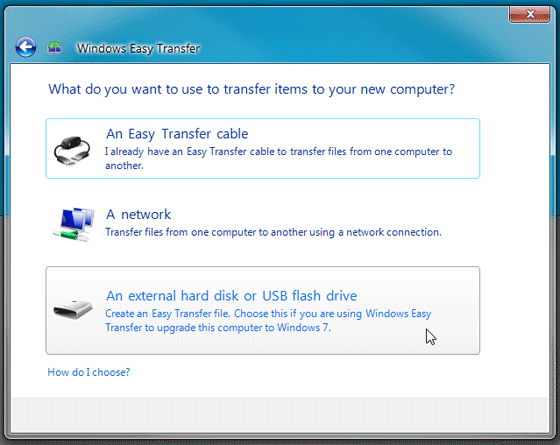 Windows Easy Transfer provides 3 options to transfer your files and settings: An Easy Transfer cable, A network and A external hard disk or USB flash drive. The first two options require connecting your new PC to old PC in order to send the files and settings. However, if you’re planning to upgrade your PC to Windows 8, select the third option that moves your system settings along with files to external hard drive.